The fall of the border town of Qusayr to the Syrian government, signs the military balance may be tipping in favor of President Bashar al-Assad, the entry of Lebanese Hezbollah fighters on his side, and the growing credence of reports of chemical weapons use by the regime have all triggered a re-evaluation of Washington's Syria policy. 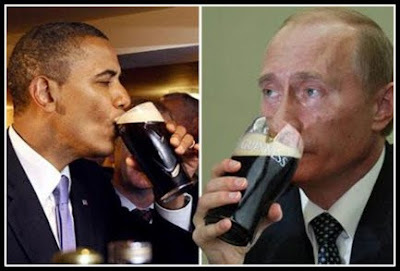 The Group of Eight summit in Northern Ireland next Monday and Tuesday will give U.S. President Barack Obama a chance to discuss Syria with Russian President Vladimir Putin and could influence his decision to arm the rebels or do something else to support them. The United States and Russia announced on May 7 they would try to bring the warring parties to a Geneva-2 conference to implement a peace plan they endorsed a year ago that left open the question of whether or not Assad must leave power. With the fall of Qusayr brought about by Syrian government forces and fighters from Iran's Lebanese Hezbollah militia, Assad seems to be gaining the upper hand on the battlefield, raising a serious question of why he would agree to any peace deal entailing his departure. Together, our two countries also remain committed to a Syrian-led political solution to the crisis there. We are deeply concerned about the dire situation in Syria, including the involvement of Hezbollah, as well as Iran, across state lines in another country. So we are focusing our efforts now on doing all that we can to support the opposition as they work to change the balance on the ground. And together, we have provided tremendous humanitarian assistance in an effort to mitigate the human suffering that is taking place in Syria. We remain committed to the Geneva 2 conference. We both understand the complications with the situation on the ground and moving forward rapidly. But there will have to be a political solution, ultimately, to the situation on the ground, and that is the framework that will continue to be the outline, and we remain committed to it. QUESTION (from Jill Dougherty of CNN): ... After this catastrophic defeat for the opposition in Qusayr, do you still believe they can win and do it without the weapons they are asking for? KERRY: Look, I think that nobody wins in Syria the way things are going; the people lose, and Syria as a country loses. And what we have been pushing for, all of us involved in this effort, is a political solution that ends the violence, saves Syria, stops the killing and destruction of an entire nation. And that’s what we’re pushing for. So it’s not a question to me whether or not the opposition can, quote, “win.” It’s a question of whether or not we can get to this political solution. And the political solution that the Russians have agreed to contemplates a transition government. The implementation of Geneva-1 is the goal of Geneva-2, and that is a transition government with full executive authority, which gives the Syrian people as a whole, everybody in Syria, the chance to have a new beginning where they choose their future leadership. Now, that’s the goal. And we have said that we will do everything we can and we’re able to do to help the opposition be able to achieve that goal and to reach a point where that can be implemented. And that’s what we’re trying to do. And I think that there’s unanimity about the importance of trying to find a way to peace, not a way to war. Now, the Assad regime is making that very difficult. We will be – as everybody knows and has written about, we’re meeting to talk about the various balances in this issue right now. And I have nothing to announce about that at this point, but clearly, the choice of weapons that he has engaged in across the board challenge anybody’s values and standards of human behavior. And we’re going to have to make judgments for ourselves about how we can help the opposition to be able to deal with that. QUESTION (from Tom Whipple, The Times): We’ve heard you say similar things for 800 days about Syria. KERRY: Well, not me. I haven’t been in office for 800 days. QUESTION: Officials like yourself, sir. Can you say – can you give us a sense, any sense at all, what you’ve been talking about in terms of the kind of help you may be offering the Syrian rebels, and why you aren’t able to say anything more than you’re saying at the moment, which you’re staying pretty tight-lipped about what you’ve been discussing in terms of this help you can give the rebels? At some point, it’s going to be too late for that, isn’t it? Do you think we’ve reached that point? KERRY: I’m not going to make judgments about the points, where we are or aren’t. I’ll just say to you that as I said to you, we are determined to do everything that we can in order to help the opposition to be able to reach – to save Syria. And that stands. That’s exactly what we’re going to do. I have nothing new to announce today. When and if I do, you’ll hear about it. But at this moment, we are in consideration, as everybody knows – it’s been written about this week. People are talking about what further options might be exercised here. And we certainly had some discussion about that, obviously. But we don’t have anything to announce at this moment. While both the regime and the opposition have allies, fact is regime partners have proved dependable and committed. By contrast, the opposition’s “friends” have led it to a blind alley. Qusayr’s defenders gave their all. The regime and its mercenaries were an invasion unit. The battle was between Syrians and an outside force alien to both Syria and Lebanon. The regime sent for it to regain control of the town. “Control” in regime parlance means the cities, towns and townships should be in ruin and their residents hushed and subdued, as they were 27 months earlier. Qusayr fell because its position on the map allowed the invaders to isolate it from its supportive surroundings. It also lets slip Damascus bosses are no more interested in connecting with Aleppo, Idlib, Raqqa, Deir Ezzor and Deraa. Their obsession is to secure a “safe escape route” to Syria’s Alawite heartland. The most important aspect of the battle for Qusayr is that it allowed the Syrian and Iranian regimes and Hezbollah to set a model for external intervention and lay to wrest the “no winner or loser” equation between the sides. The said equivalence was the raison d'être for Geneva-1 and the June 2012 Geneva Declaration. The regime never accepted the Geneva Declaration, except slyly. The Russians and Iranians embraced it simply to promote the regime’s own interpretation of the document – namely, a political transition led by their ally Bashar al-Assad; otherwise no solution. Occasional Russian statements feigning indifference to Assad’s fate were smokescreens. They have dissipated in the buildup for Geneva-2. The West and so-called “Friends of Syria,” for their part, proved ready to forfeit the Syrian people’s blood because their humble aspirations do not serve their interests. The “victors” will not suffice with Qusayr ahead of Geneva-2, having known by now that the White House’s “red lines” are anything but red and Washington’s coaxing and flattery of Moscow will fall on deaf ears. The “victors” are also conscious that Israel has numbed and shackled America’s Syria undertaking and is now flirting with the Kremlin, knowing that Moscow’s future role would serve her interests. Israel is of the same mind as Russia, Iran and Hezbollah in preferring Assad and his regime to remain in place – much as it helped Iran poach Iraq and shares Tehran’s strategic designs to destabilize the Arab Gulf. The Syrian people are not beaten, or down and out yet. But they could be if Washington kept playing second fiddle to Moscow on Syria. Labels: "Friends of Syria", #Hezbollah, #Qusayr, Arab Gulf, Assad, Geneva 2, Geneva conference, Geneva Declaration, Hague, Iran, Israel, Kerry, Obama, Russia, Syria, U.S.